When I told my girlfriends I was making 'pavlova' for Ladies Night In, only ONE of them knew what that was. What is it, you wonder? Well, according to my Canadian guru, it's "a rainbow in your mouth". That's a direct quote, people. 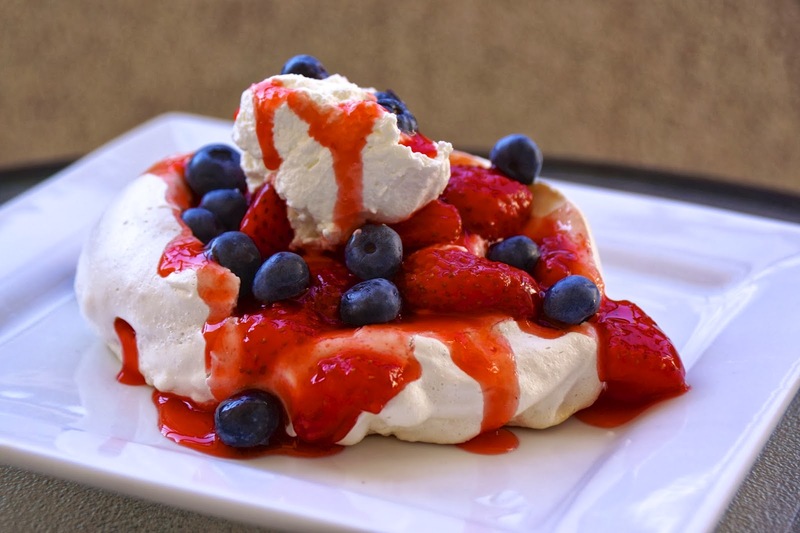 However, if "rainbow" is a bit too vague for you, here are the nuts and bolts: Pavlova is a baked meringue, usually filled with fresh cream and fruit. Or, it's a rainbow in your mouth. That just sounds so much cooler, don't you think? Warning: This recipe seems complicated, but I promise it's NOT. In fact, pavlova is fairly simple to make. People think it's hard because there are three layers we're working with. However, each layer is pretty simple, and one can be made ahead of time. 1. The baked meringue - these whip up, literally, in about 10 minutes, but then they spend an hour in the oven. So, it may appear to take a long time, but you're really only working "hard" for ten minutes. 2. The fresh whipped cream - Again, this takes about 5 minutes to whisk to perfection. You can also skip this step entirely by using fake whipped cream (aka: Cool Whip or ReddiWip), but please, please don't do that. Fresh is worth it, I swear. Try it once, and you'll see the light. 3. The strawberry compote - Only a few steps, this takes 10 minutes to prep. AND, you can make this ahead of time and keep in the refrigerator until you need it. So, you see, this whole process isn't as complicated as it seems! I'll start by showing you the steps to make strawberry compote and you'll be amazed at how easy this is. Begin by combining 1/4 cup warm water with 2 teaspoons of cornstarch. Then, in a saucepan, combine the cornstarch mixture with 4 cups of strawberries (hulled and cut in half), 2 teaspoons lemon juice and 1/2 cup sugar. Warm this over medium heat for 5-7 minutes, stirring frequently. The strawberries will break down slightly, and a thicker sauce will develop. This will smell fantastic. When done, remove from heat and let cool. Easy, yes? At this point, you can refrigerate the sauce for up to a week. I like to make mine the day before so it has plenty of cooling time, plus it thickens a bit in the fridge, but the choice is yours. The next item you'll make is the meringue. Also super easy, peeps! Go ahead and preheat your oven to 275 degrees. Prepare a cookie sheet with parchment paper. You likely need two cookie sheets. I did. 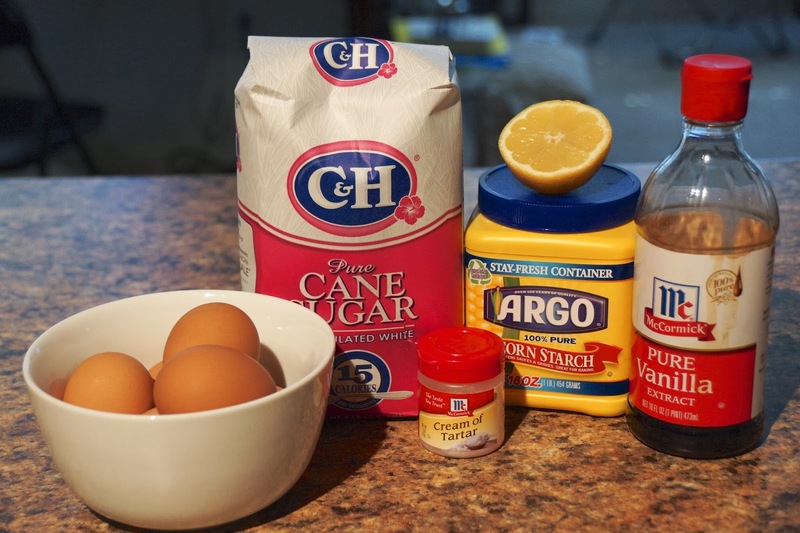 In a small bowl, mix together 1 1/2 tablespoons cornstarch with 1 1/2 cups sugar. Set aside. Separate your whites from yolks immediately after removing the eggs from the fridge (save the yolks for another recipe, if you like). Then, allow the whites to sit on your counter for about 30 minutes. This will bring them to the proper temperature. In a large bowl, whip the whites (on medium speed) with 1/2 teaspoon cream of tartar, until soft peaks form. Increase your speed to medium-high and slowly add the cornstarch/sugar mixture to the whites. 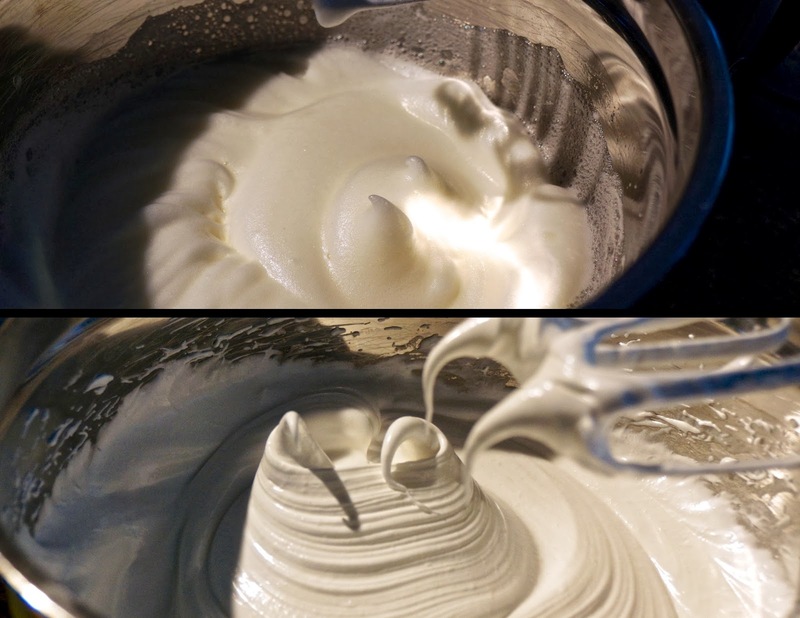 Whip until stiff peaks form, but not so long that the meringue becomes brittle or dry. Then, gently fold in 1 1/2 teaspoons each of vanilla and fresh lemon juice. Try not to eat this right out of the bowl either, though you'll be tempted! 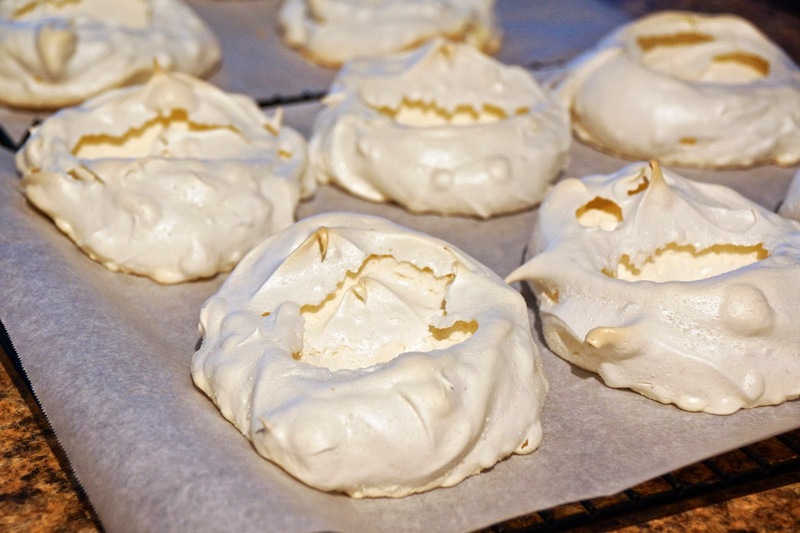 Place your meringues in the oven, and immediately reduce the oven temperature to 250 degrees. Bake the meringues anywhere from 45-60 minutes. Because all ovens, locations, and humidity factors vary, I suggest checking them at around 30 minutes. If the meringue is browning too quickly, reduce your temperature. I find mine are done at about 54 minutes. You will know they're done when the outside is lightly brown and the meringues lift easily from the parchment paper. Allow to cool slightly, ok? While these are cooling, it's a good opportunity to make your whipped cream. Now, as I said, you could always use the fake stuff, but why would you? 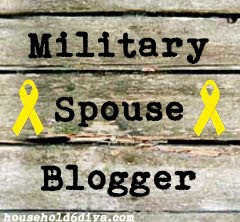 Not when you can quickly and easily make it yourself. See how simple it is: Whip together 2 cups of heavy cream and 6 tablespoons of sugar until soft peaks form. Don't over whip though, or you'll make butter instead. And that's it for whipped cream! You can't keep the fresh stuff longer than about 8 hours (refrigerated), so plan on using what you make that day. Not exactly hard though. I'd eat it right out of the bowl, if necessary. Sacrifices must be made. Start with a baked meringue on the plate. Spoon some whipped cream into the hole. Add fresh fruit (I like blueberries, but you can use anything), and drizzle all over with your strawberry compote. Top with another spoonful of whipped cream, because it's pretty. Then prepare for your guests to be amazed. I love fancy desserts that aren't really fancy, don't you? You see, this dessert may have looked complicated (and your guests will certainly think so), but it's actually pretty simple. Who doesn't want to be served a dessert that's a rainbow in your mouth? Nobody I know! Happy cooking, my friends. As always, the recipe is below. I'll be back soon with more fun desserts! 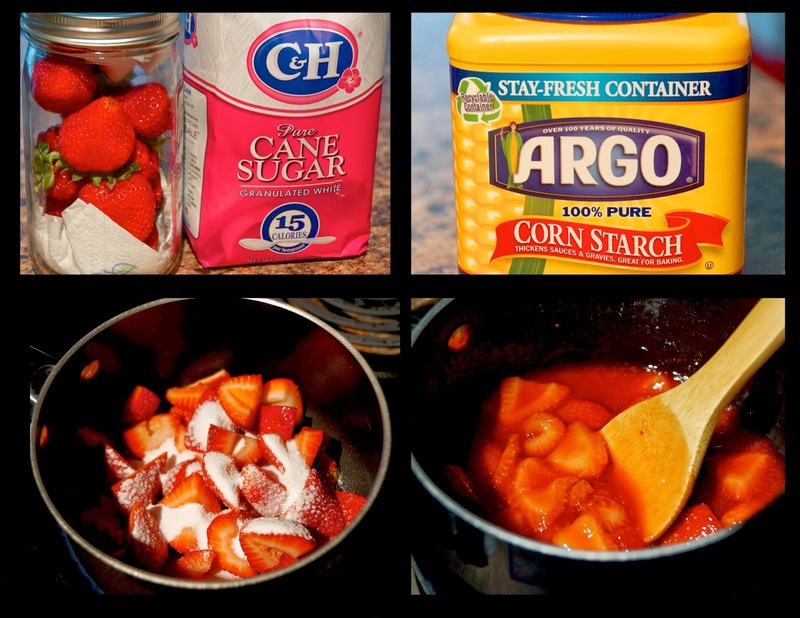 For the strawberry compote – Combine the water and cornstarch together. Add all ingredients to a saucepan over medium heat. Heat, stirring frequently, for 5-7 minutes. The strawberries will break down slightly, form a sauce, and thicken. Mixture will become very fragrant. Once thick, remove from heat and set aside to cool. For the pavlova - Preheat oven to 275 degrees. Prepare a large cookie sheet with parchment paper (may require two cookie sheets). Blend the sugar and cornstarch together. In a separate bowl, whip the egg whites with the cream of tartar on medium speed until soft peaks form (about 3 minutes). Increase the speed to medium-high, then slowly add the cornstarch/sugar combo to the egg whites. Whip until the mixture is stiff, but not dried out. Gently fold in the vanilla and lemon juice. Spoon individual portions onto the parchment paper. The meringues should be circular, about 3 inches in diameter. Be sure to place the meringues several inches apart. Use the back of a spoon to make an indentation in the center of each meringue (this will later be filled with cream and fruit). Reduce your oven temperature to 250 degrees. 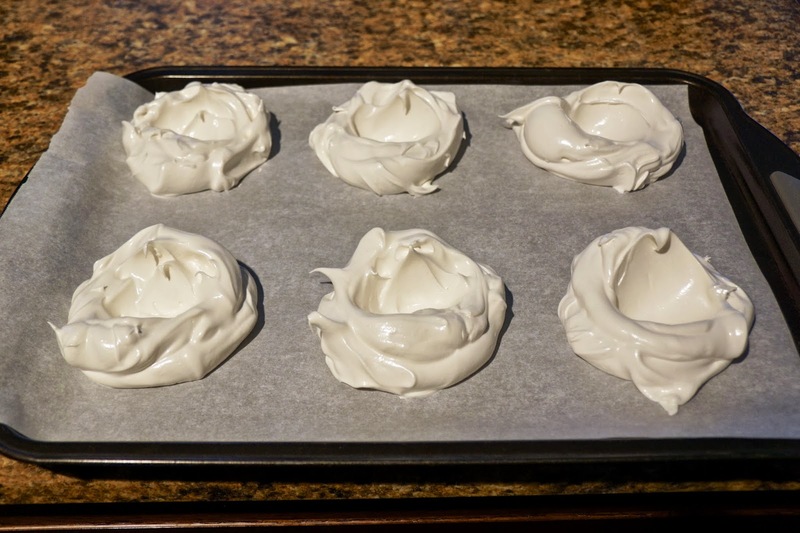 Bake the meringues for 45-60 minutes. Check for doneness at 30 minutes, as ovens vary and this is a delicate dessert you do not wish to overbake. If the meringues are browning too quickly, reduce oven temperature to 225 degrees. The meringues are done when the outside is lightly brown and they lift easily from the parchment paper. For the whipped cream – Wisk together the heavy cream and sugar until soft peaks form. Do not overwhip or you will make butter instead of whipped cream. To serve: Place a meringue on plate. Fill the indention with a bit of whipped cream. Top with fresh fruit of your choosing (blueberries, raspberries, blackberries, kiwi slices, etc), then add a generous drizzle of the strawberry compote. Top with another dollop of whipped cream if desired. Leftovers: Store the meringue covered, at room temperature. These will only keep for a few days. The whipped cream must be used within a few hours. Do not store the cream, always make fresh and discard any leftovers. Refrigerate the strawberry compote up to a week.